:( :( :( :( :( fat GG! i dont think i can go with low fat diet..lOL! am always starving for food!hahaha..LOL! As usual.. awesome pictures Mon!! Hahahaha I used to weigh 45 kgs 10 yrs ago too!! LMAO! Gone were the days! You see mon, you telling me and marzie we no need to lose weight. and you SW also still want to lose weight. So that means we REALLLY need to lose weight!! So good la this service! Can eat to my heart's content and still remain SW, so nice! and all the pics......you have posted till now.......i though you eat a lot........ do you work out????? how could you BD with that? it looks so yum yum that by merely looking it makes me hungry. 48kg and you still thinking about losing weight? =-O =-O =-O =-O =-O tsk tsk tsk! Happy Sunday Mon. The food look delicious indeed! Wow, these food look really delicious, I am salivating now! Haha! I have to agree with Bill. You still look great, and so does the food in the pics! Sweetie, I can't believe you think you need to slim down. You are slim and already skinny...why do you want to lose more weight? It looks like to me that you've got a negative self-image. What matters is that you're healthy, slim and has a positive self-image. Being skinny does not mean "beautiful,", "lovable," and "likeable. "If you're too thin for your height and metabolic rate, you are going to suffer a lot of diseases. I am 5'5" and weigh 54 kilos, and I used to weigh 50 kilos....and never in my life I had wanted to slim down. It is because I know I am healthy and my weight is normal for my height. When I was 50 kilos, I did not even dreamt of getting thinner than I was and now that I gained 4 kilos , I still want to remain at my weight and if I gain a few more kilos, I don't care. It does not mean I am less of a person or I look ugly or look disagreeably. Monica, you don't need to trim down your weight....you should take a look at yourself and point out your best assets ----and that includes your slim figure. A lot of people crave and yearn for the figure and weight you've got. What if you trim down more, would you like the look of protruding collarbones, and your skeletal figure? Plus a superskinny figure also connotes "negatively"----people look at you like you're sick-----bulimic, anorexic, with a lot of psychological problems.....looking like a dead person doesn't look beautiful. Wow! Ok... I'm around that weight but I, on the other hand, trying to gain weight cos I think Im too thin.. lol! huhuhu u missed da chop! 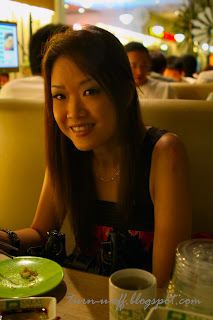 my hubby alwiz complain that i'm too skinny and as a mother of 3, my weight is only 50kg. like you, i'm so thankful that i've a high metabolism rate. i can munch whatever i want.